Jacksons Lane - OMG Keats! OMG Keats! was an exciting project between Jacksons Lane and Keats House. Young people from across London who are interested in heritage and the arts joined together to research and celebrate the life and works of the poet John Keats. On Saturday 18th March 2017 St Thomas More School students gave four performances at Keats House, Hampstead of Writ in Water, an immersive theatre production devised with performance artist Kazuko Hohki. Their audience were taken on a magical journey into the nineteenth century. 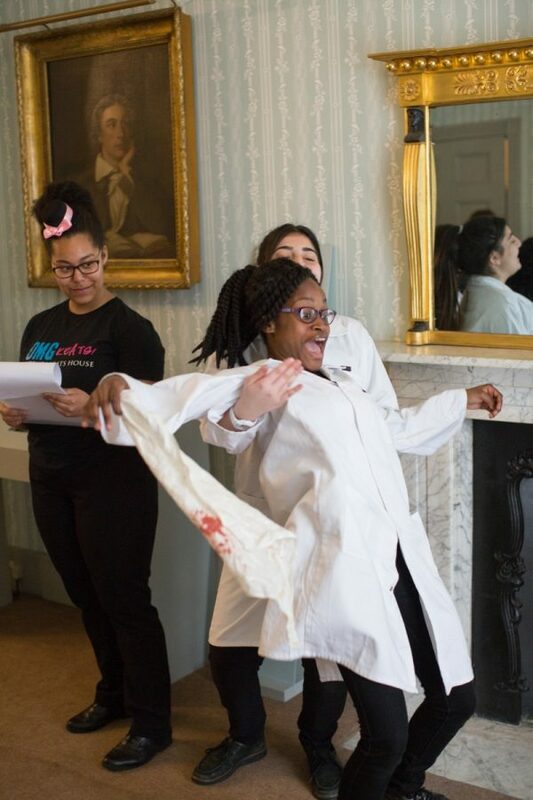 In July 2016 young people from organisations such as Haringey Shed, Centre 404, Channing School for Girls, JL Circus and more took part in a summer Mash Up in the garden of Keats House where they performed their own response to Keats; see a snippet below. In October 2016 half-term, a group of young people formed the OMG Keats! film crew working with Chocolate Films, a professional film production company to produce a docu-drama based on Keats' life and his experiences at Keats House. They participated in all elements of the film making: researching Keats' life, storyboarding ideas, script writing, location planning, directing and acting for the camera, using professional DSLR cameras and sound equipment, and Final Cut Pro X for the post-production editing.